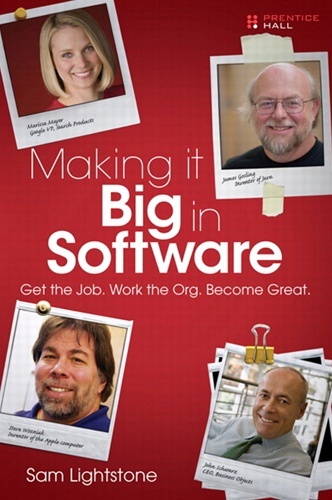 The Software Insider's Guide to Getting Hired and Getting to the Top! Here's all the information you need to jumpstart your software career: the best ways to get hired, move up, and blaze your way to the top! The software business has radically changed, and this book reveals today's realities--everything your professors and corporate managers never told you. In his 20 years at IBM as a software architect, senior manager, and lead programmer, Sam Lightstone has briefed dozens of leading companies and universities on careers, new technology, and emerging areas of research. He currently works on one of the world's largest software development teams and spends a good part of his time recruiting and mentoring software engineers. This book shares all the lessons for success Sam has learned--plus powerful insights from 17 of the industry's biggest stars. 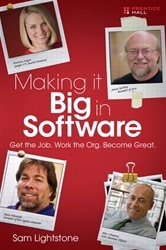 Want to make it big in software? Start right here! Move up to "medium-shot," "big-shot," and finally, "visionary"